I think I have strep throat beat. It's time to get back to some fun . Most of my cards go to family and friends so I have a lot of occasions every month. I made these 2 cards back in Jan. to start replenishing my card stash. I learned how to put my signature on my cards Fri. , but I won't put it on these two because I CASED them from card mags, changed them up a bit, but the original idea belonged to someone else. I think my recipients will enjoy them just the same. 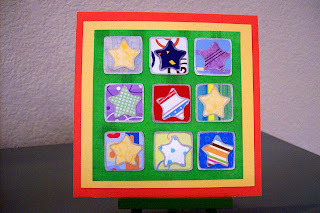 The 1st card I used: Fiskar's Stars-1 template, assorted background paper scraps, and a Sharpie Metallic Silver pen to go around stars and squares. 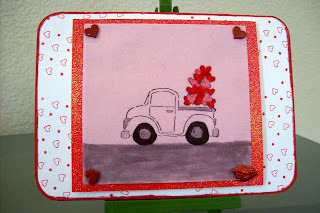 The 2nd card I used: Stampendous Happy Heart Cube stamp, Stampin Up Loads of Love stamps, glitter paper, vellum, Fun Flock on the hearts in the truck, CTMH markers, and glitter brads from JoAnn's. The star card is so very bright and cheery! I like the way you combined the papers.